Don’t get us wrong, we appreciate the talents of Jared Leto as an actor. In fact, his Niander Wallace in Blade Runner 2049 was creepy and menacing and pretty much a perfect portrayal of an insanely rich businessman with a god complex. But, his Joker in Suicide Squad didn’t do it for us. On-set method ickyness aside, the shirtless look with gold grill and tats is not how we see — or want to see — one of the greatest comic book villains of all time come to life on screen. 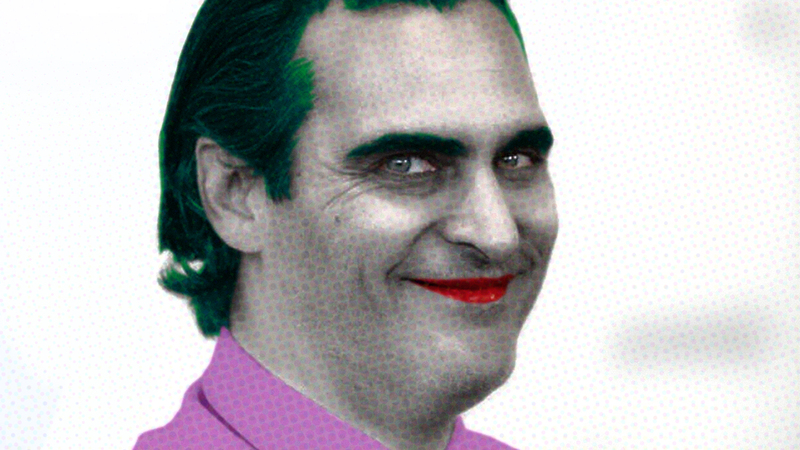 Given the time period, it seemed unlikely Leto would play the Joker in Phillips’ movie, unless he planned on mining the comic book storyline where the Joker is immortal. Now, it’s clear that he plans on looking for someone else to wear the purple zoot suit and that someone may just be three-time Oscar-nominated actor Joaquin Phoenix. According to Variety, Phoenix is Phillips’ “top choice” and the reclusive actor, who once considered playing Doctor Strange before Benedict Cumberbatch took the role, “has agreed to the role” after it was initially offered to Leonardo DiCaprio. The studio intends that Phillips’ movie fall under a “new banner” of DC Comics movies that is unrelated to the current cinematic universe. Your photoshop picture is amazing…….ly creepy!